The exotic italian island of Capri in the bay of Naples was the perfect setting for my love of turquoise & white. The entire landscape as you can see is dominated by these colors.To proclaim my love for these colors - my attire readily obliged ! This island was a famous resort of the Roman emperors! You mean since 27 BC ? ( head spins). Amazed how the beauty has been preserved. So, I must have been someone in the Roman empire,. No? The main feature of this island is that it is a unique combination of beauty & glamour. You will know more in my travel post on Capri! You must wonder, why the running shoes? I was tired after 3 days of excessive walking in Rome and found solace in my comfy pair of Pumas .I wish I could have worn open sandals , but my aching feet didn't allow me to . Nevertheless, i wore my favorite trends- Color-blocked skirt, White blazer, Animal motif chiffon blouse and my statement necklace to please myself. Carrying a blazer helps as the winds can get chilly . And glares, dare you forget them you will be blinded by the strong sun ! Leaving you with a glimpse of the beauty and the other pretty , glamorous details will follow in the next post ! So, enjoy these pictures and get ready for the Capri travel post next. I bet you haven't seen anything as beautiful and as GLAMOROUS as the island of Capri! Excited for the Capri Travel post? Thanks Rupa! The top is really versatile! Oh yes, it has the power to hypnotize! Thanks for stopping by Krithi. Gosh u look gorgeous..n i love ur skirt. 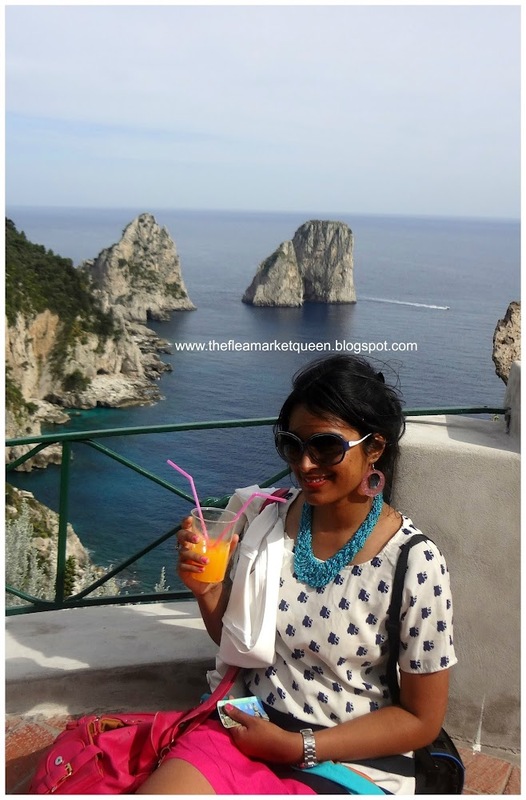 *blush* Yes , Capri is a paradise on earth, stay tuned for the travel post to know more!